A risk manager’s life is not an easy one. Their role by definition is one of vigilance and challenge. Yet a good risk manager can be a facilitator within the bounds of their control mandate, rather than a blocker. Risk management in gas and power markets poses a particular set of challenges given the unique nature of these as traded commodities. But this does not justify the fact that in many energy companies, risk management is often accepted as a function with the negative purpose of tidying up after the ball has been dropped. Risk management should be a commercially-contributing discipline. Achieving this does not need to threaten the independence and objectivity of a risk management function in pursuing its control mandate. A number of cardinal factors can be identified that should be developed purposefully to underpin a positive role for risk management. We explore these below. Before addressing the solution we start with a quick summary of the problem. It is a reality that dynamic commercial functions such as trading and origination do not enjoy being given the answer ‘no’. But this is not in itself the problem. There may be junior traders who do not appreciate the importance of maintaining a robust risk boundary, but their bosses usually get the picture. Some of these criticisms are an inevitable function of different vantage-points, responsibilities & incentives. But others often have some legitimacy. Importantly a number of these issues can be resolved and doing so is good for business (i.e. it saves risk capital and supports commercial value creation). There are a number of factors that drive a positive and effective engagement between the risk management and commercial functions. The successful evolution of risk management within a company starts at the top. That means adequate resourcing, a clearly defined risk mandate and effective delegation of authority. Senior management support for risk management must be real and obvious (e.g. serious breaches mean serious discipline). Risk management also needs to be adequately represented at an executive level, something which is increasingly being facilitated in energy companies by hiring in executive level risk managers in a Chief Risk Officer (CRO) role. 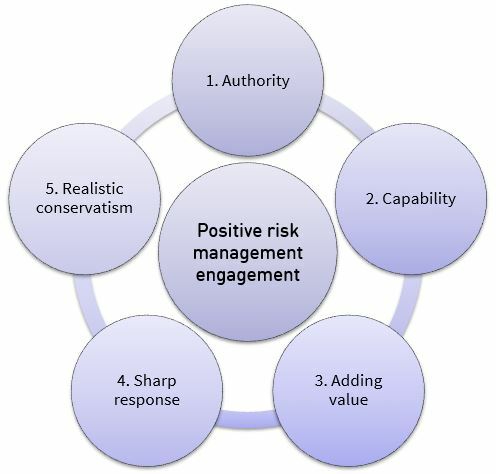 A constructive relationship between senior risk and commercial managers is the foundation of the other positive engagement steps described below. It is difficult to plug these gaps by hiring bank staff without energy knowledge or energy people without technical risk management skills. The capability described above can also add value to commercial functions (e.g. trading and origination). The most obvious example of this is a constructive engagement between commercial and risk functions to ensure deals are competitively priced within the constraints of the risk boundary. This can be via more effective pricing of embedded risk premiums or via the design of tailored products with better understood & managed risks. Origination is where this can really come into its own, particularly for complex or structured deals. Many of the best origination opportunities effectively involve selling a company’s risk management capability to a counterparty. This means that commercially-aware and creative risk managers are highly valued members of commercial teams. They facilitate conversations like ‘you can’t do it like that, but here’s another way’ or ‘it would be cheaper if you could do this instead’. Efficiency of response is an important service provided by risk managers. Commercial functions know that external customers like swift responses – it wins business. In turn they expect a similar response from their ‘internal customer’ relationships. For risk management this applies to decisions on policy rulings, valuation sign offs and new product & counterparty approvals. Good process is key to success in this area. This means streamlining routine processes & decisions to the maximum degree possible, sometimes even to the extent of ‘automation’ (an aspect we will consider in a later blog post). It also means well-oiled and efficient communication between risk and commercial teams, and the constructive two-way sharing of information (e.g. on limit headroom and market events). Good risk management functions also exercise a degree of intelligent anticipation, where decision-support tools & methods are in place and calibrated before they are needed, not after. A risk manager’s job involves providing an independent view on deal valuation and the quantification of risk (e.g. premiums for basis risk). This is not always an easy job. Conservative numbers kill business, while being too aggressive undermines the integrity of the risk management function. But finding an intelligent balance and backing it up with robust analysis engenders respect. A good risk manager can issue the challenge back to front office ‘bring us stuff in the right format, that is policy compliant and not covered in basis risk and we’ll be able to put a value on it cleanly & keenly’. There is often no-one more acutely aware of the issues described above than the risk manager responsible for addressing them. But change requires a recognition of these issues at a senior management level, adequate resource allocation and the constructive support of commercial functions. The implementation of change can also come with governance issues. For example the tight integration of risk managers with commercial staff can undermine the integrity of a risk management function. The contribution of risk management to commercial value-added can also be problematic given incentives and potential conflicts that can arise. In a subsequent blog post we will consider how these can be resolved within the commercially dynamic framework we are advocating. A business is as strong as its weakest link and risk management is a key part of the chain, not just the hand-cuffs. Intelligently constituted, risk management can make a positive and valuable commercial contribution, at the same time as meeting the proper requirements of governance and control. Timera Energy provides tailored in-house workshops covering, among other areas, energy risk and portfolio management. If you are interested in finding out more please contact us.